This set was a real eye catcher for me. 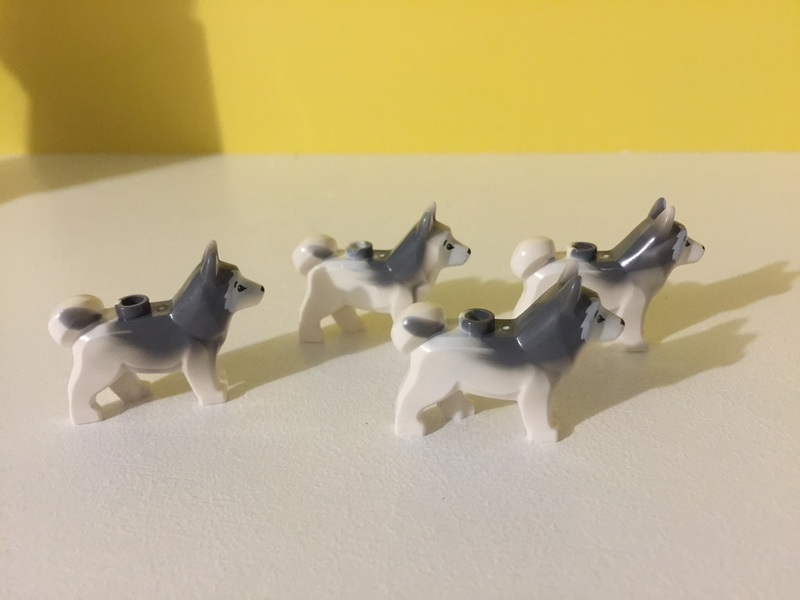 It looks great, and I didn’t have a helicopter in my collection at that stage, or any dogs, let alone 4 brand new huskies! 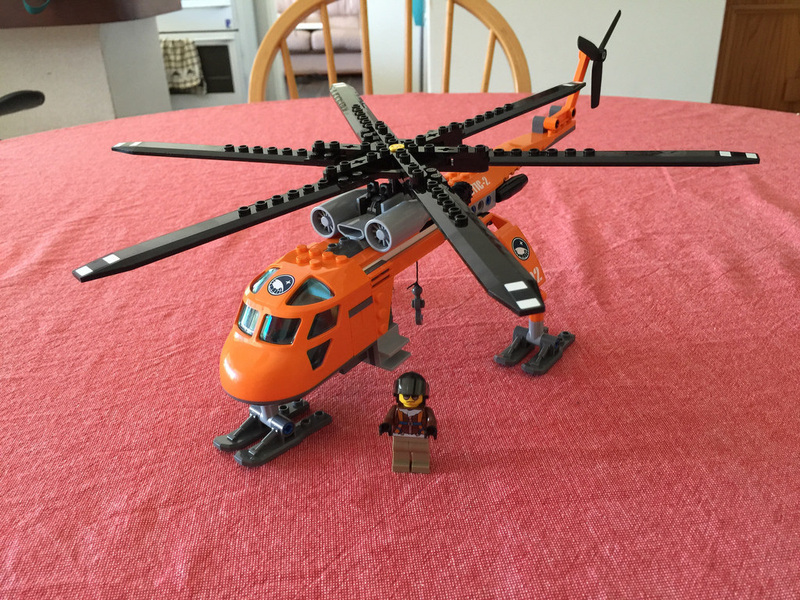 This chopper may look familiar, but only on a larger scale. Yep, Australia’s own LEGO Certified Professional, Ryan McNaught has built a monster scale version of this beast! Elvis, as he is known to many Aussies, is an Erickson Heli-crane, and can occasionally be seen flying around the country putting out fires, as well as in LEGO form on Ryan’s Flickr page. Anyway, on to the set! Out of the box you’ll find three parts bags, two instruction booklets, and a small sticker sheet with 12 stickers. 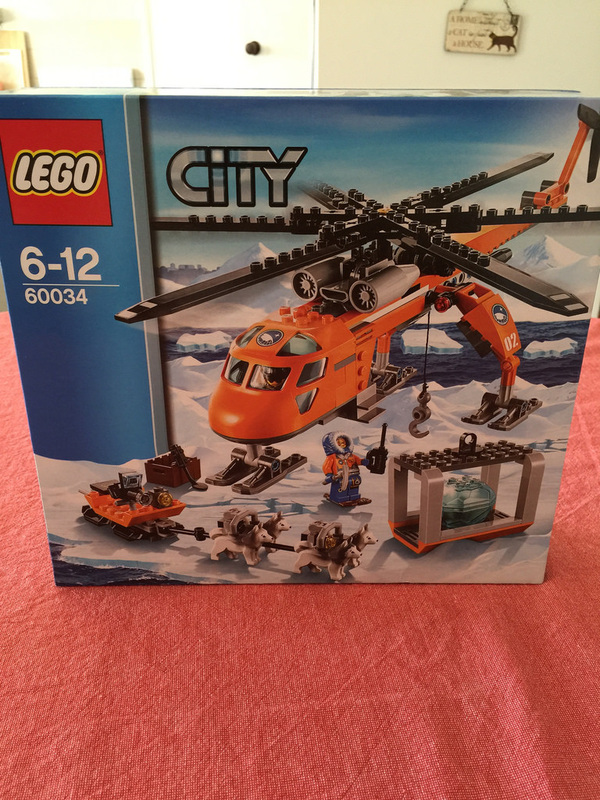 The Arctic subtheme of City is well known for bright orange parts, and this set is no exception. There is a good amount to get excited about with this set. Firstly, and what caught my eye in the first place, was the huskies. 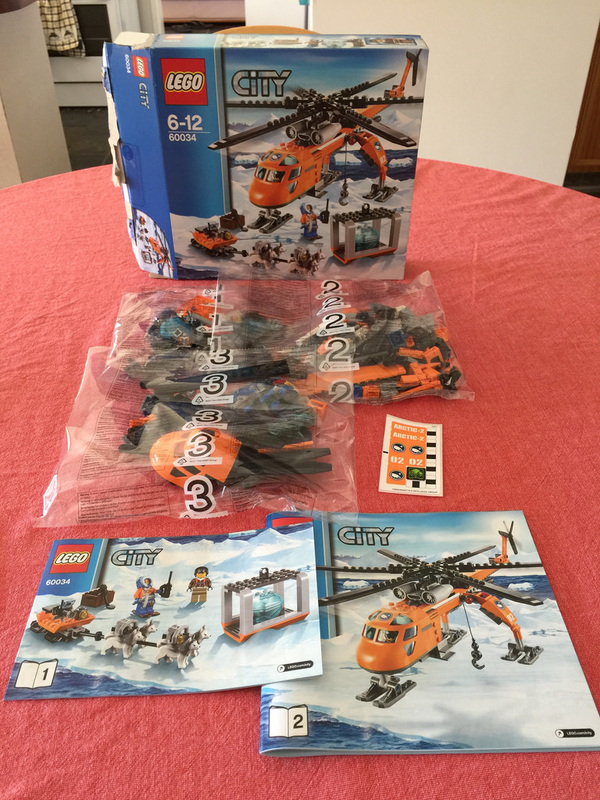 There are four in this set, and these have been introduced with this range of Arctic sets. Even more interesting to note is that they are all slightly different, having little differences in their dark grey colouring. This makes them really unique. 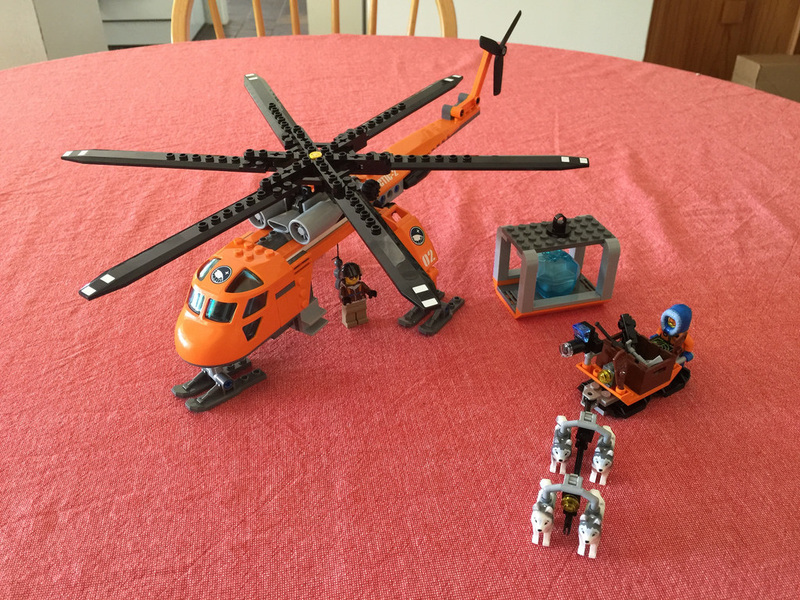 The rotor blades are pretty good to have, as well as the bright orange front of the helicopter. This set also introduces 2 new elements in the 4×6 angle beam, and the angle connector, both in bright orange. There’s also the big ice chunk top and bottom, which is a good little container as well. 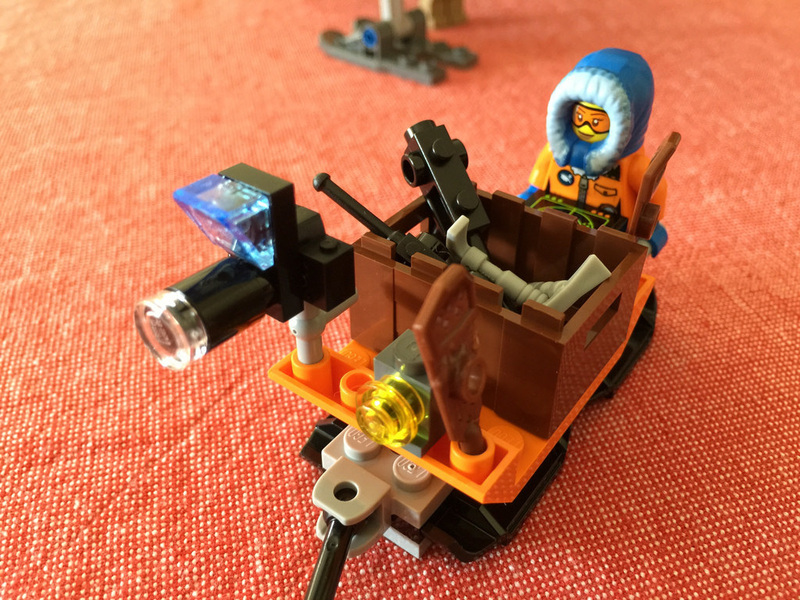 The minifigures are quite standard, although one, the explorer, is a female. Both have single sided faces, and back printing, with the explorer having leg prints as well. 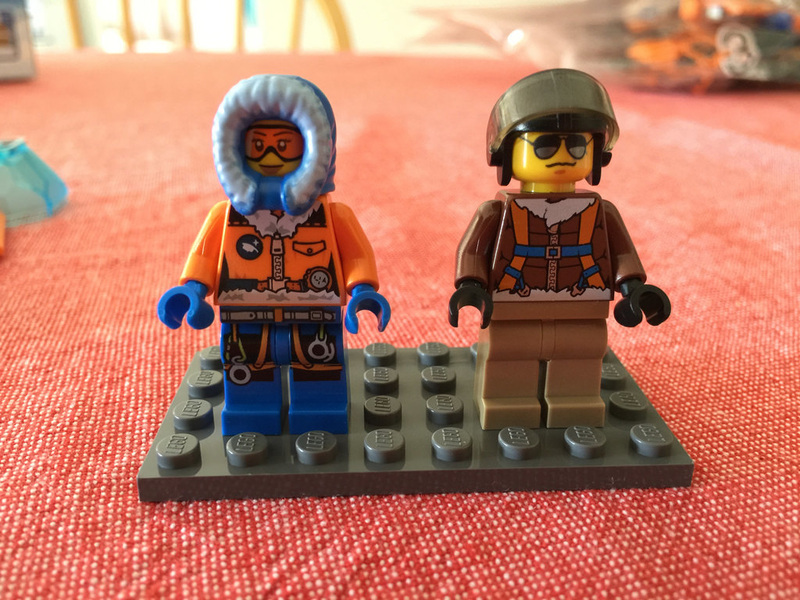 The pilot has a brown fur jacket on, with a parachute and head gear, while the explorer has the standard orange and blue jacket and hood found in the Arctic sets. 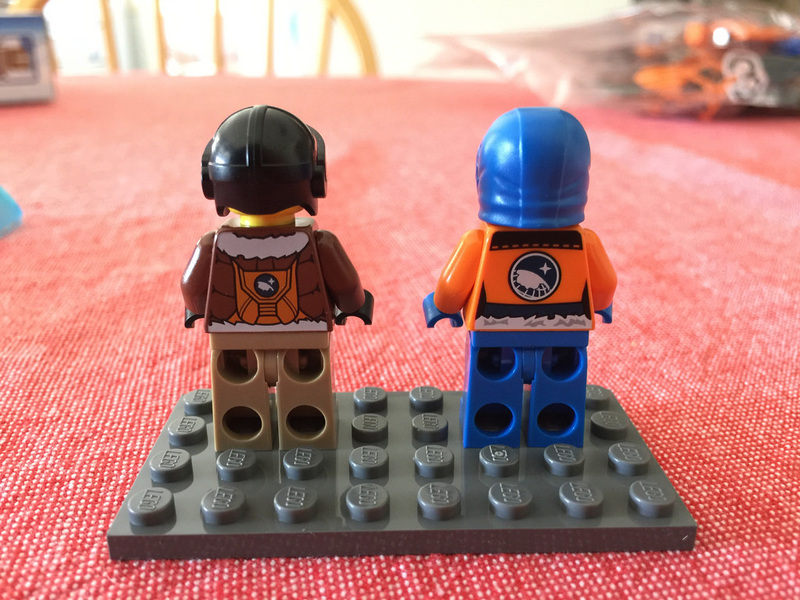 Both have gloves on (different coloured hands), with black for the pilot and blue for the explorer. Both are quite nice minifigures. Again, pretty standard spares with this one, with some Technic pins, spare visor, gear lever, clear elements and a t-bar. The first thing built is the sled. It’s a pretty simple build, but is quite effective. There’s a nice SLR camera with big lens for the explorer mounted to the front, with a navigation console as well. There’s also a crate with metal detector, ice-picks and walkie-talkie, and a pair of snowshoes. It holds one explorer comfortably at the back. 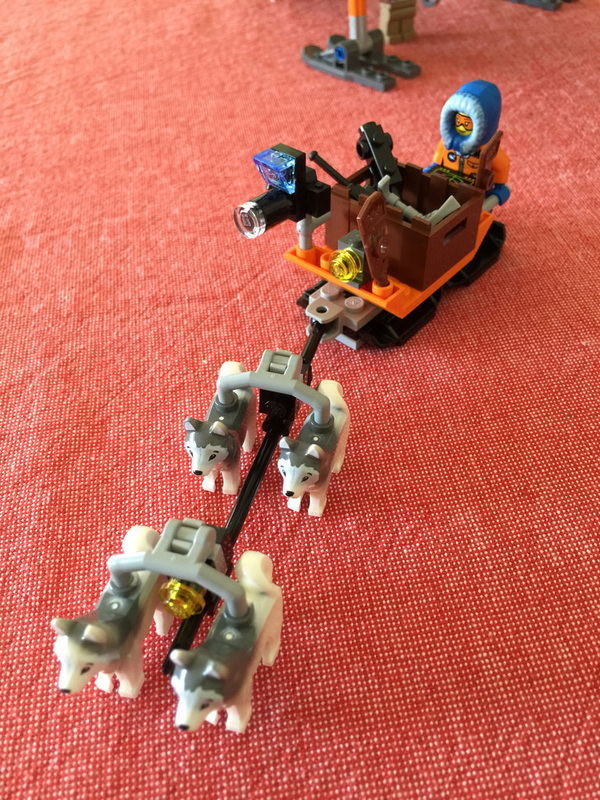 The dogs at the front are paired up, and look really good when attached to the sled. Thanks to the ball joint, there’s a fair bit of movement available. Next up is the cargo for the helicrane. It’s pretty simple, with just enough space for the big chunk of ice. It looks pretty good, and has a crystal inside it. It looks really clean and useful for other cargo. Finally, there’s the helicrane itself. I was really impressed with this. 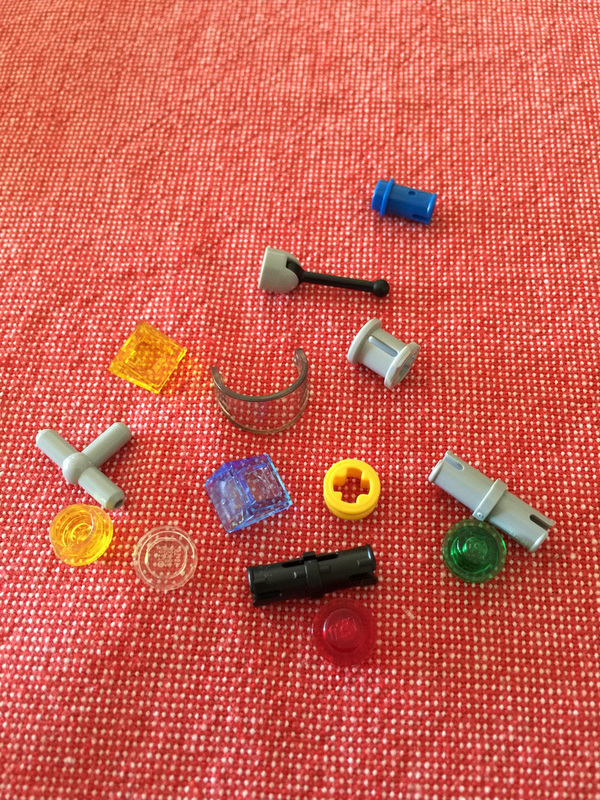 As I’ve said in other reviews, I’m really bad at judging a size of a set from the box alone. This set was much bigger than I originally anticipated. It looks really good, and I’m planning on hanging it off my ceiling. There’s massive rotors, and skis instead of wheels. The only issue I have with this one is the stickers. The stickers themselves are annoying, yes, but the main issue is the colour. The orange of the sticker is a little different to the orange of the element. It would be much better to have transparent stickers instead. When the rotors are spinning, they can have a tendency to wobble a bit, but I’m not sure how LEGO would fix that issue, as I haven’t got any other helicopters in my collection (yet!). The helicrane has a little winch that is used to raise and lower the cargo box. It works fairly well, but the cargo can’t be wound up all the way to the top, which is a shame. This set gets 8 out of 10 ice crystals. It would get a higher rating with transparent stickers and a slightly more stable rotor system, but they’re minor quibbles. Next week I’ll be reviewing 60076: Demolition Site. Stay tuned! There’s plenty to look at in that set. Remember to comment below with your thoughts and like BricktasticBlog on Facebook!